I, like Nature, abhor a vacuum, so, even tho’ ’tis not my turn, I am adding a small post here while we catch up with the schedule. It all started with a need to listen to something interesting while I was stitching. I turned to a radio programme broadcast last year – about artists’ studios. Great, because I have an insatiable curiosity about where and how artists work. Even better that the presenter/interviewer was an artist herself: a printmaker of whom I had not heard – Susan Aldworth. And there started a marvellous journey of discovery. 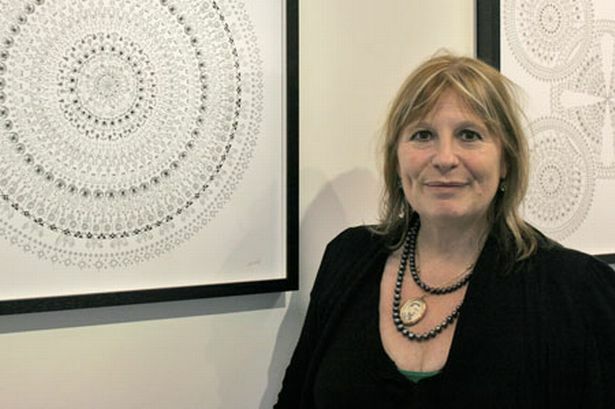 An artist fascinated by the idea of self, Aldworth has examined and used scientific and medical imaging and interventions to do with the brain, including her own brain scans. I was particularly mesmerised by the next programme I listened to: an interview with a friend who has epilepsy, and whose portrait she was making. I was intrigued and moved by the sounds of the epileptic brain! I followed this immediately with a programme about the printmaker Stanley Jones of Curwen Press. The three programmes together gave me a great deal to think about, and it was not until the following week that I returned to see the film about Susan Aldworth’s latest project called Transience. It involves making prints using slices of brain donated by sufferers of Parkinson’s disease – donated with use in making art included in the purposes agreed by the donors. I found the film compelling viewing, and am still thinking about it all. I would love to know what anyone thinks of the work and the thinking behind it as discussed in this film. Clairan, I have not read Pat Barker at all. I heard odd episodes of a serialised reading of Life Class (I quite often listen to the radio when I am stitching). I shall put them on my Kindle wish list, thanks. In the film she says that she’s a mark-maker and the anatomy of the brain gives her a very strong language to work with … a language is understood by other speakers and listeners, though, and I wonder how a “language” derived from images that not everyone has seen and/or understood can communicate… It may be that there’s something in her use of that “language” that is doing the communicating … and this process would be more mysterious than the brain-images are in themselves; it reflects the mystery of “who am I” that she referred to at the start of her presentation. And she says, “My natural inclination is to be more lyrical than scientific”. Margaret, I find this artist’s work difficult to enjoy. I find it all incredibly thought-provoking, with layers to get through to a satisfactory appreciation. The first layer of difficulty was, as you say, a lack of language interpretation on my part. The epilepsy portrait I was not drawn to at all visually; but the interview did pull me in. Somehow my imagination was fired by the conversation and the sounds, but not the sights. The Transience work aroused curiosity, but I’m not sure I understood their purpose other than simply seeing what would happen. Does the result promote any understanding, artistic or scientific? But maybe that is just me. I think that it is interesting that artists do explore all sorts of directions where most do not go. I enjoy hearing about the processes, the reasoning, and seeing the results – they all contribute to my own thinking about process, my view of the subjects of art and approaches to expression. But I do not always understand, appreciate, or enjoy the works.